On September 17, 2018, the King County council voted 5-4 to allow for a new funding agreement between King County and sports stadiums such as Safeco Field. There have already been challenges to the legislation and it may appear as a petition on the ballot soon. 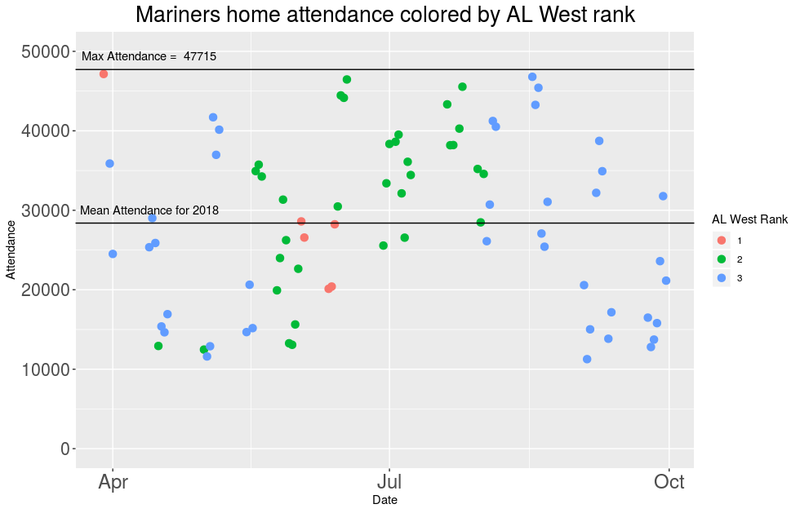 The 2018 season was unusually successful for the Mariners, and while they are again sitting out the Playoffs this season I did wonder what attendance looked like this year. I added two lines to this plot, one for maximum attendance (currently 47,715 according to Wikipedia) and one for mean attendance which was 28,389 this year. This means that we have a stadium that is on average about 60% full for any game for a team that competed for a Playoff spot until the very end of the season. Is that really the best use of this money?